Homesteading is often touted as one of the most frugal ways to live, and a great way to save money. But what is the honest story behind homestead costs? Does homesteading actually save money? And if so, on what? In 2011, my family and I moved to a 5 acre piece of property with a little white house and a big red barn on a dead end dirt road in Minnesota. I had all the plans to make all the things happen. The gardens would be ginormous. The barn would be filled with animals. I would add grapevines and apple trees and we would convert the unused hay shed into an aquaponics area. We would go off-grid. Y’all, I had all. the. plans. And the great thing was that these plans were going to net me a life where I lived even more frugally than I already had been in my pre-homesteader life. I was gonna be a homesteading rockstar on a shoestring. Because homesteading saves money, right? Homesteading can save money. But don’t forget that running the homestead costs money, too. We need to make sure that we’re framing the whole “homesteading saves money” thing correctly, because some people are confused about what that phrase actually means. Living frugally while trying to run a homestead is a different story than most people realize. In your adventure as a homesteader, sometimes you’ll come out ahead, other times behind. Most times you should just pray to break even. Now. Lest I get messages and emails from people telling me their own experience of how they moved to the country and now live on practically nothing a month, I want to assure you—there are ways we have saved money by homesteading in the country. Lots of them. But I also think we need to be honest about the fact there are a whole heck of a lot of people out there who have a fantasy that they are going to move to the country and have little to no bills because they’re going to go off grid, put in a huge vegetable garden, and raise some chickens. A zest for the possibilities of what lies ahead in homesteading is a great thing to have, but we need to make sure we don’t plow ahead blindly with a misunderstanding regarding what we’re in for as a homesteader. Some of that honesty and truthful homesteading education begins with those of us who are writing the articles, making the YouTube videos, and producing the podcasts that people are listening to to learn about the homesteading life. It’s important that we’re all honest enough to help people understand that sometimes the idea of moving to the country to become a homesteader can sometimes be cheaper than actually moving to the country to become a homesteader. We forget to talk about all the homestead costs. Homesteading is not free, y’all, but some people out there are selling it as such. I hear so many people say they want to move to the country and get a fat piece of land. To be completely honest, I was one of these people. When we were first looking for a farm, we didn’t want anything less than 40 acres. Why? Because we were going to do all the things and we needed a lot of space to do all the things. But what we realized at one point while driving around looking at properties was that the more land you have and the more things you want to do with that land, the more money it costs. Not just in seed or head of cattle, but in things like machinery and fencing. Oh, the homestead costs! The pigs and chickens and turkeys cost money. Feed costs money. Hay costs money. Garden seeds still cost money. Repairs to the barn, fuel for the tractor, a new axle for the horse trailer, materials to fix the fence—they all cost money. So do pressure canners and meat grinders and dehydrators and canning jars and vacuum sealers. Oh. And not to mention all the stuff that comes up that no one can really warn you about. Because when you’re dealing with homesteading, things always come up. Homesteading may save you money in some areas of life. 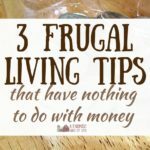 And yes, you can choose to do things as frugally as possible in your homesteading journey. But homesteading is not free. While I’ve got your attention about homestead costs…there are qualifications to the whole “homegrown is cheaper” argument. A reader once told me of friends who had newly committed to the simple life and, going whole hog, bought a homestead and moved to the country to grow and raise all their own stuff. But what they didn’t plan for was the cost increase of going from a dollar menu and Ramen diet (as the reader described it) to growing organic kale and pastured pork. They were under the impression that growing their own would save them money. If I’m used to buying organic kale at the store, then I probably will be pleasantly surprised to find that sticking my own non-GMO seeds in the ground and turning out my own organic kale tends to be a bit cheaper (if you’re not counting your time). But if you’re not used to eating that food on a regular basis? Friends. Your food budget can go up. Even as a homesteader. I’m not necessarily saving money baking my own bread. Not when I could go to Walmart and grab a loaf from the discounted rack for thirty-nine cents— especially when you factor in that I’d hope my time spent baking the bread is worth something. I can’t put a full homegrown meal on the table for cheaper than a pot of generic macaroni and cheese, and neither can you. And yes, some might say that’s comparing apples to oranges because freshly baked homemade bread is arguably better than preservative filled store-bought, and a full homegrown meal deserves to be in a completely different category than generic macaroni and cheese—and I agree with you. But y’all there are people out there trying to make the shift from a less than healthy existence to one that is simple and healthful and soul-healing, and they think that by sticking some seeds in the ground, their food bill will completely disappear. And some of this is because of how we’ve talked about homesteading and the simple life and growing and raising your own food. Growing your own and raising your own means that some of your food costs haven’t necessarily disappeared, they’ve just shifted. I know of homesteaders who have freezers full of homegrown chicken or pork, who, if asked, will tell you their amazingly small food budget for the month—fully neglecting to add in the cost of that homegrown chicken or pork to their food budget. The costs of raising (not to mention, the time invested) are somehow wiped from the books. As if because they raised the meat in the freezer, it doesn’t count. Somehow, it’s viewed as “free meat”. And I get it. I really do. But this is not the way to give people an honest estimation of life as a homesteader. There are real homestead costs involved in raising animals and growing vegetables or fruit. Homestead costs that are sometimes forgotten about? This: a lot of frugal tips don’t work for homesteaders in the country. Give up your daily latte! A daily latte? That would mean (gasp) going to town daily. See the next point. The grocery store nearest to my house is 9 miles away. The economical store that I prefer to shop at is 20 miles from home. Folks, I’m not lazy, but I’m not walking. Hauling hay, feed, and pulling trailers isn’t a job for a little car, and neither is plowing through a countryside snowstorm. Shop around, and clip coupons! How far are you from the nearest shopping mecca, again? How much do you want to spend in gas? And have you ever seen a coupon for flour or apples? Compare prices on internet providers! In some country locations, getting reliable internet from even one company takes some finger crossing. There are some places where (gasp) you still need a landline to gain access to that (sorta reliable) internet. So, considering the subject of homestead costs, does being a homesteader save money? “So, you would say that moving to the country doesn’t save money?” I asked. a big HELL YES from me over here. I don’t say I ‘homestead’ because here in Ontario, we just call it farming. The first move to a new property or a new animal is so very expensive. Once you’ve got a set up that you can manage going forward, maintenance is always cheaper, but my half recycled 8×12′ chicken run was still $500 to build because its still cheaper to build it once and build it right, than to build it again after it falls apart. I don’t think people realize how expensive it is to get a decent set up, good livestock, then to keep it all alive. Amen! When my husband and I bought our 6 acre homestead 3 years ago we were definitely not prepared for the actual cost of homesteading. Fencing to keep chickens and deer out of the garden and neighborhood dogs away from the chickens? Nearly $1000. Building a new chicken coop using scrapped tin for roof and walls? About $600 (lumber and wood screws are expensive). New All American pressure cooker to preserve fruit and veggies? $300. And no, selling my free range organic eggs for $3/dozen doesn’t cover feed costs. To us this lifestyle is worth it, but it definitely is not cheap and requires big financial sacrifice sometimes (not getting a fancy new fridge after buying fruit trees for the orchard!). Oh and sacrificing time, energy and vacations too….it’s hard to find someone who wants to look after 50 chickens and a garden!